"What a delectable treat for Eggnog lovers everywhere! 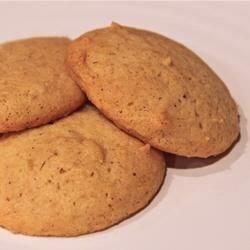 These cookies have a wonderful spicy aroma and are great tasting. The fragrance of nutmeg and cinnamon will infuse your home with holiday spirit as you bake these cookies. They make delicious gifts and are a welcome addition to cookie exchanges." Cream sugar and butter until light. Add eggnog, vanilla, and egg yolks; beat at medium speed with mixer until smooth. Add flour mixture and beat at low speed until just combined. Do not overmix. Drop by teaspoonfuls onto ungreased cookie sheet 1 inch apart. Sprinkle lightly with nutmeg. Bake 20 to 23 minutes until bottoms turn light brown.